Did you know that “Q-Tip”, “Dumpster” and “Thermos” were all trademarks at one time? Once simply brand names for “cotton swabs”, “large waste can” and “vacuum flask” respectively, all have since lost their trademark status to one common problem: genericization. Genericized trademarks are words that used to be brand names but have become ingrained in common speech as a way to refer to all brands of a single product, not just the brand or service of the original trademark holder. A trademark often becomes genericized when one company dominates the market for a single product or is the original manufacturer of a new product. 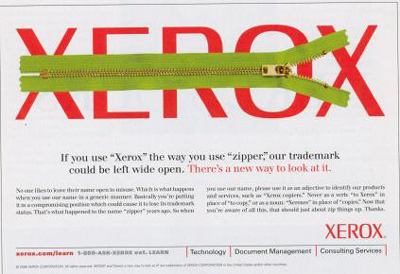 The use of a trademark as a verb will also led to the term becoming generic. 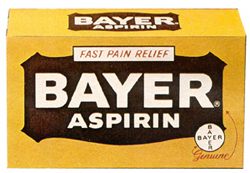 Consider Aspirin: once a trademark used to identify a brand of acetylsalicylic acid manufactured by Bayer, “Aspirin” today has come to refer to any such acetylsalicylic acid products. Indeed, many are not even aware that “Aspirin” isn’t the name of the drug itself, but instead a once-clever brand name for a much more scientifically-labelled compound. Additionally, “laundromat,” “trampoline,” and “dumpster” are more general words in the English language that once had trademark protection. Google – The search giant has its own policy on only using the word “Google” as an adjective – never as a noun or verb or in the plural or possessive form – and that generic term must follow the trademark. People should say “Google search engine” “Google search” or “Google web search” or similar. Rollerblade – Rollerblade USA defends its ubiquitous in-line skate brand by sending “cease and desist” letters to publications which use the trademark as a verb. 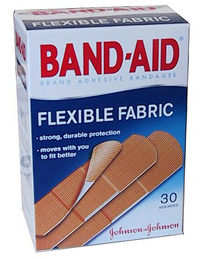 While some brand names for newly invented products may be much catchier than the item’s actual descriptive name for common people (“Let’s go inline skating” vs “Let’s go rollerblading” -OR- “Take an aspirin” vs. “Take some acetylsalicylic acid tablets”), when not used as an adjective to describe the item itself, using trademarked names in this way ultimately leads to brand dilution. As people continue to use brand names in everyday speech – as nouns and verbs, most especially – that product name becomes synonymous with every version of that product, rather than the one specific brand. Without constant monitoring and due dilligence, no brand is safe from trademark genericization if appropriate steps aren’t taken. ← Invention Geek – Instant Ice Pack?